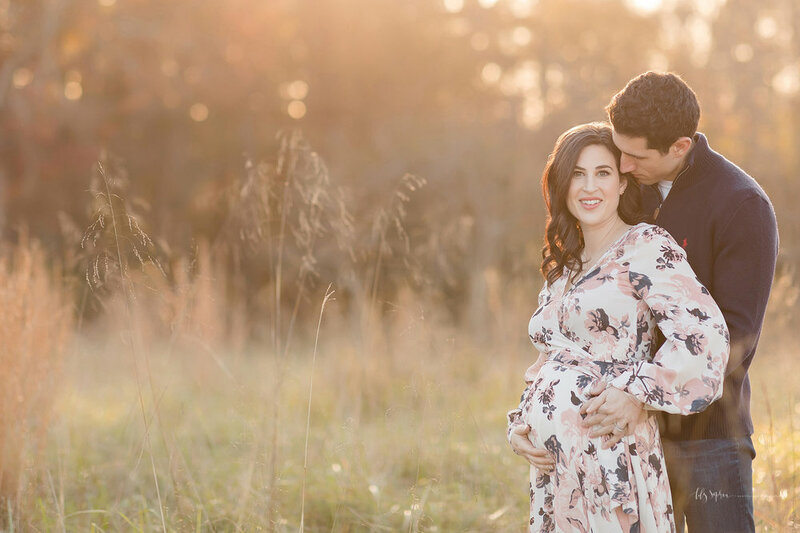 Ashley is an advance planner, and she contacted us early in her second trimester to schedule a maternity session at the field location. 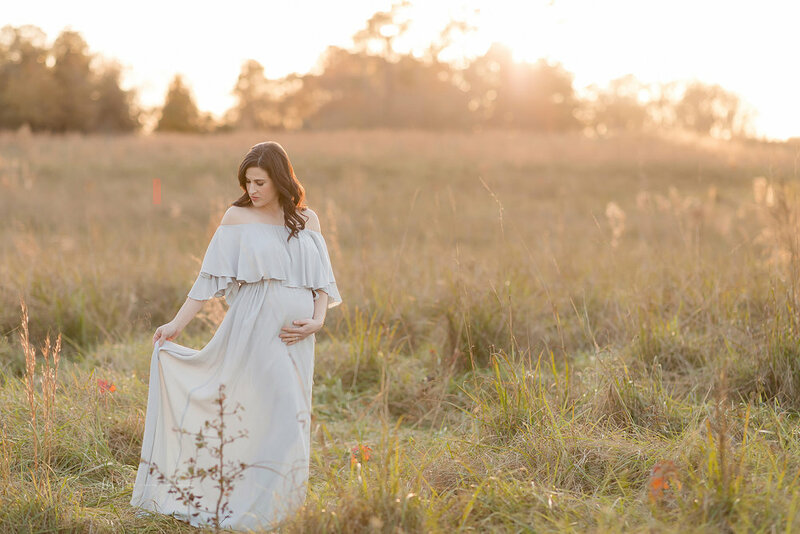 She also booked a newborn session as well, and opted to add on hair and makeup services to both. 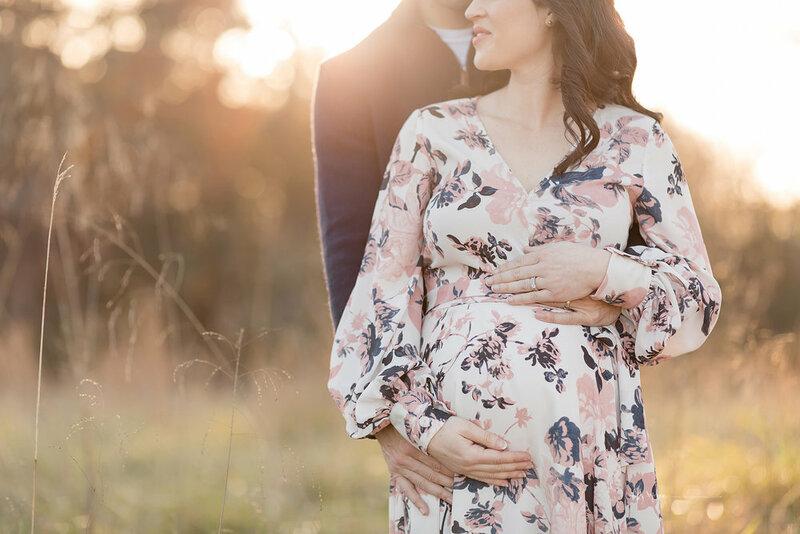 Most of our clients do reserve their sessions sometime in the second trimester and this helps in having more date options to choose from - especially if you need a weekend date outdoors! I only photograph outdoor sessions in the hour before sunset, hence the limited availability on the weekends. Many clients schedule their outdoor sessions in the summer months for weekdays since the sun sets closer to 9 PM and traffic isn’t an issue when we’re getting started. 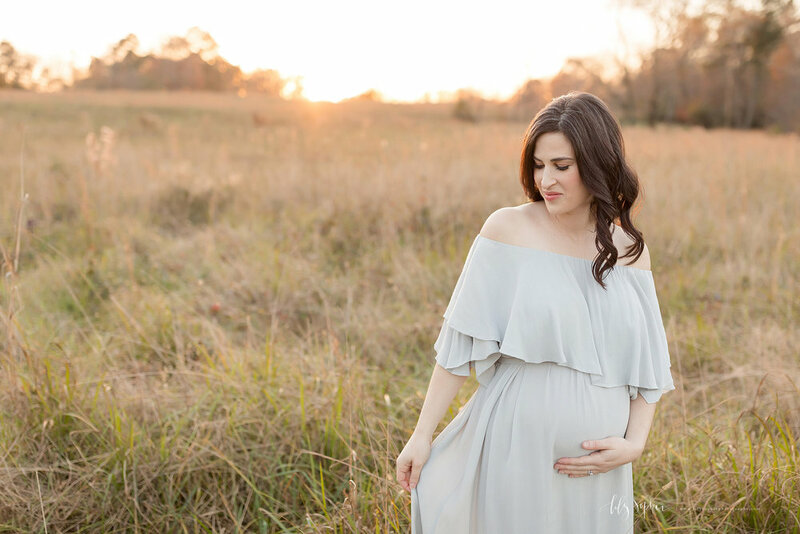 Ashley came to the studio after the Thanksgiving holidays for her maternity fitting, and we discussed her style preferences. She was worried that it would be pretty cold for their December session, and I reminded her that there was just no way to predict that in the south! 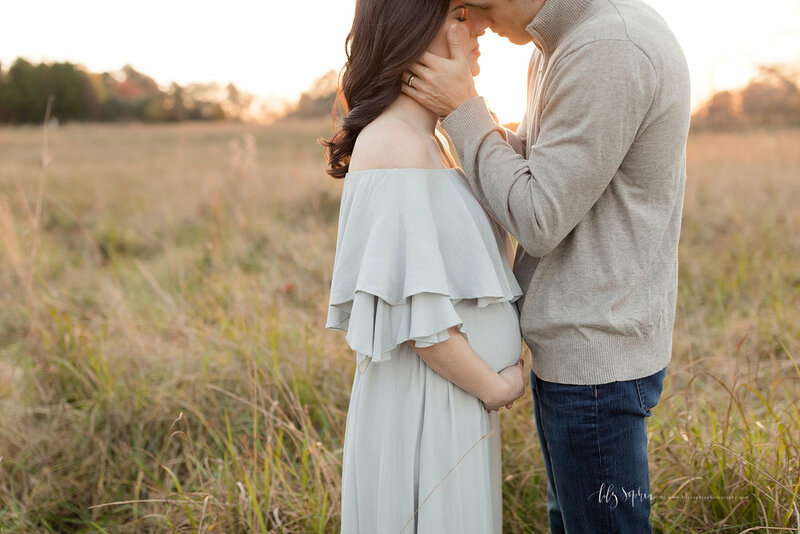 (keep reading to find out what the temperature ended up being on their session date!) After she tried on multiple pieces from our studio wardrobe, she chose a gorgeous off the shoulder dress and a floral gown with fun long sleeves. Before she left, we discussed what her husband Marc should wear based on what she had chosen. I followed up later that day by sending her our style guide so that she could refer to it while going through Marc’s closet! The style guide is super simple and most importantly - easy to follow. If you have any questions or want more input, I’m available via email. Many of my clients bring an armful of options with them to their session if they’re not sure, and I make a quick decision to pull it all together. You decide the level of support you need from me, and you’ll get it! The week of the session, it rained, and rained, and rained some more. I don’t watch the weather too carefully because who needs the anxiety? I always warn clients not to stalk the weather until we are a couple of days out, but I know it’s hard to not check the forecast. Fortunately for us, the rain stopped and the temperatures warmed up… to a nice and mild 72 degrees on the day of their December session! It was sunny and felt like a gorgeous spring day. Mild winter days are another reason why I love living in Atlanta so much - I photograph outdoor sessions year round because it’s rarely cold enough to necessitate moving inside. Ashley had told me at her fitting that she and her husband weren’t pros in front of the camera. Guess what? Hardly anyone is! I’ve had a few clients from the film industry that work as professional actresses, and even they sometimes feel a bit nervous in front of a camera. It’s totally normal! Don’t worry - I’ll take care of you. My direction is very straightforward, and we’ll have a lot of fun during your session. Just come ready to have some fun and connect with your partner, and I’ll handle the rest. 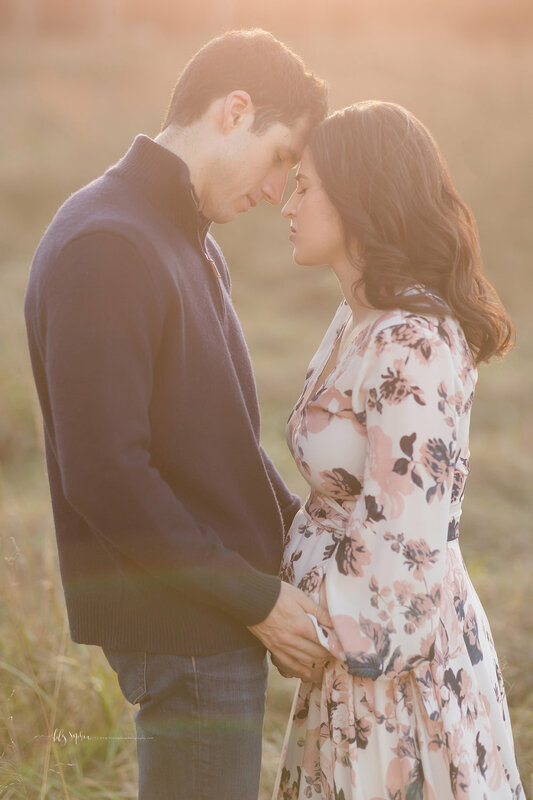 During the session I asked how adventurous they were, and they looked at each other and said “We’re up for anything!” So we tromped through tall grass and briars to get to the perfect spot, and the resulting images were absolutely stunning. I love when clients are willing to go outside of the box a little bit for creative purposes, because it’s always worth it. 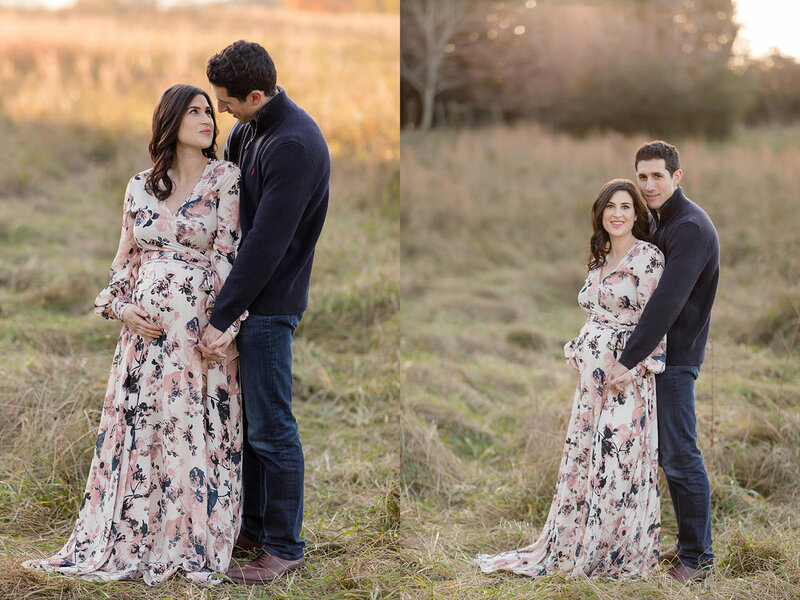 Enjoy a handful of my favorite images from this beautiful session at the field. 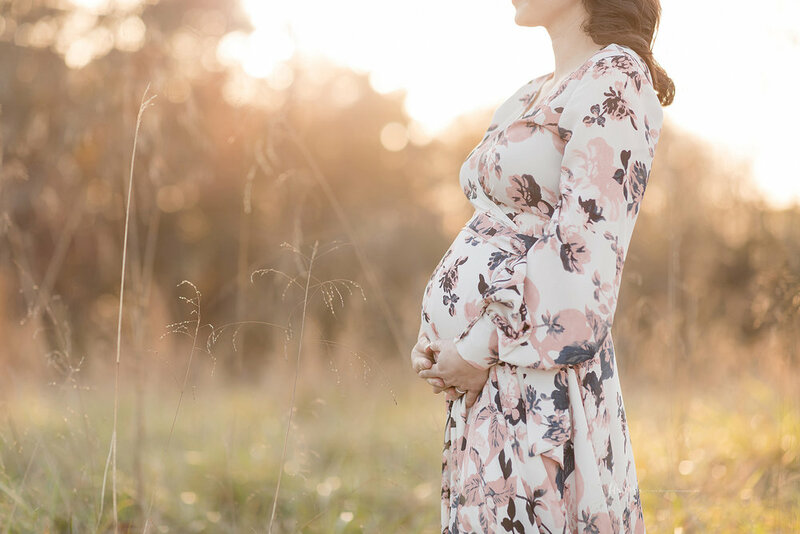 Ashley’s look was created by our lead HMUA, Margaret, and both dresses are from the studio wardrobe which is available to all clients (you don’t have to be pregnant!) to borrow from if they so choose.